Make Halloween a fun and safe night for children and adults alike. From candy to pumpkins to the costumes, Halloween is a fun-filled time for kids and adults alike. However, it can pose dangers. 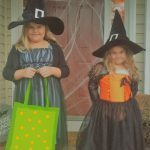 To help make this year’s trick-or-treat a safe and fun time, follow these simple safety tips compiled by the American Academy of Pediatrics. Plan costumes that are bright and reflective. Make sure shoes fit well and costumes are short enough to prevent tripping, entanglement, or contact with flames. Because masks can limit or block eyesight, consider non-toxic makeup and decorative hats as safer alternatives. Hats should fit properly to prevent them from sliding over eyes. The makeup should be tested on a small patch of skin ahead of time to ensure there are no unpleasant allergies on the big night. To keep homes safe for visiting trick-or-treaters, parents should remove from the porch and front yard anything a child could trip over such as garden hoses, toys, bikes, and lawn decorations. Just because one car stops does not mean others will!